1) The fraction that has survived (this is self-evident). 2) The fraction that has been surveyed. All told, close to 2,000 sites were examined by the Israeli teams, of which about 800 were previously unknown. 3) The fraction that has been excavated. Way back in 1963, only 150 of 5000 sites were excavated and only 26 were major excavations. More than 1000 new sites have been identified since then. 4) The fraction that has been examined. With limited sampling from excavation, negative conclusions can be premature and dangerous. 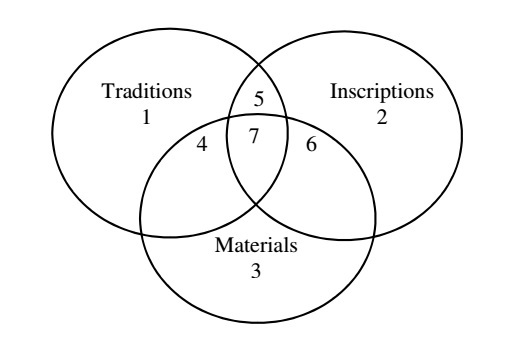 Yamauchi gives a sketch of these “overlapping circles of evidence” in archaeology and history. As a working example, Yamauchi suggests an optimistic estimate that ignores redundancy: 1/10 of materials and inscriptions that survive, 6/10 of available sites surveyed, 1/50 of sites excavated, 1/10 of excavated sites examined, and 1//2 of excavated materials and inscriptions published. This would give a fraction of (1/10 x 6/10 x 1/50 x 1/10 x1/2) or 6/100000 of all possible evidence. Given the fragmentary archaeological evidence, caution is in order for protagonists from both sides of the debate. As they say, the absence of evidence is no evidence of absence. This does not stop critics from asserting that there is no Exodus or Joshua’s conquest, simply because the guild is unable to come to consensus about the dates of the archaeological remains. The minimalists display an admirable sense of certainty, if not arrogance, when they pronounce the biblical texts to be pious fiction rather than reliable history. All respectable archaeologists have given up hope of recovering any context that would make Abraham, Isaac, or Jacob credible “historical figures…archaeological investigation of Moses and the Exodus has similarly been discarded as a fruitless pursuit. Indeed, the overwhelming archaeological evidence today of largely indigenous origins for early Israel leaves no room for an exodus from Egypt or a 40-year pilgrimage through the Sinai wilderness. A Moses-like figure may have existed somewhere in southern Transjordan in the mid-late 13th century B.C., where many scholars think the biblical traditions concerning the god Yahweh arose. But archaeology can do nothing to confirm such a figure as a historical personage, much less prove that he was the founder of later Israelite religion. However, it cannot be denied that the skeptical archaeologists have not been consistent in their own judgment. For example, no one disputes the fact that the Babylonian empire was conquered by the Persians, even though there is no identifiable ruins and rubbles in Babylon attributed to the Persian conquest. Similarly, there is ready acceptance of the suggestion that Jerusalem in the mid-1330s BC was ruled by a certain chieftain by the name of Abdi-Heba, simply because the reference is found in the Amarna Letters from Egypt. Apparently, critics quietly ignore their demand for corroboration when no material evidence of such a ruler is forthcoming. Perhaps, arguments and conclusions in archaeology are not so objective after all. The subjectivism is evident when critical scholars are willing to give the benefit of doubt to non-Biblical testimony while presuming that the Biblical documents are pious fiction until proven otherwise. Critical historians rely on Assyrian narrative reliefs, inscriptions and chronicles as ‘primary’ sources to provide the context to ‘reconstruct’ Israelite history while they reject the biblical sources which they judge to be ideological and therefore unreliable ‘secondary’ sources. But studies have shown that the Assyrian sources are no less ideological since there were inscribed to glorify the reputation of the king. In effect, critics are selectively critical because they prefer non-biblical sources that are amenable to an interpretation that is attractive to a skeptical guild. Such inconsistencies suggest that the personal biases of archaeologists play a more significant role in their judgments than they are willing to admit. To his credit, Dever shares a hint about his personal worldview when he voices agreement with the minimalist Philip Davies and opts for a critical approach to archaeology which is “humanist about scripture; agnostic about deities”. [p. 287] Dever’s requirement for material corroboration is reasonable for an archaeologist seeking to investigate the evolution of material culture and social formation of ancient Israel, but it is reductionist to restrict religious manifestation only to accessible archaeological materials. It betrays a positivism that truncates religion of its transcendental dimensions. Dever has executed a demolition job against the minimalist-revisionists, but his secular approach to archaeology remains reductionist towards biblical faith. By the same token, we may say that archaeological artifacts are mute and need to be supplemented by other ancient texts whenever possible, and interpreted by the historian working from a clearly defined research framework. For the believing historian, this requires taking the biblical text seriously (in contrast to the critical historian) because for him the memory of the events were transmitted with utmost seriousness and accuracy, and eventually recorded as text at a time close to the events they describe (in contrast to secular-critical historians who assume that the Jews freely distorted tradition when the texts were allegedly inscribed centuries after the alleged events). Since research presuppositions or bias is unavoidable, it is incumbent that every historian fully discloses his personal interests so that the reader can properly evaluate his proposals. It is unfair and intellectually dishonest for critical historians to claim complete objectivity and the right to define history while presuming that the judgments of their religious counterparts are to be rejected as bias and unreliable. What is required for all historians is that they be transparent about their criteria for selection so that their research bias or presuppositions come into view. Carl Henry wrote in his massive 6-volume God, Revelation and Authority, “What places the historian under obligation toward events is that his own judgments of importance do not in fact constitute the external situation; actually, if he is to be worthy of professional respect, he must be concerned with a response to historical evidence” (volume 1, p. 162). The question is not bias as such, but whether the bias is congruent with the text and supporting evidence. Davies and Dever are entitled to work within a secular or critical framework in archaeology, but by the same token believing historians should not be prohibited from working within their religious framework. Believing historians are entitled to base their research on religious epistemological presuppositions and specialize in a program of biblical archaeology and history, just as critical historians are also entitled to work with secular or critical presuppositions and explore the wider program of Syrio-Palestinian archaeology and history. In the end, the validity these competing schools rests on their ability to integrate the textual and material evidence into a plausible history that gives an adequate account of the origin and experience of the community of faith. The fundamental issue arising from the ongoing dispute in archaeology and critical history is whether Christians should rest their faith on a reconstructed background of the text that is inherently contestable. That God originally revealed himself in ancient Israel in mighty acts and prophetic speech should be affirmed, but the only access to God’s revelation Christians have today is Scripture. A Christian interpretation will assign primacy to Scriptural text while keeping an open mind towards incorporating insights gained from archaeological and historical criticism. However, since these insights are tentative and inherently contestable, the reconstructed biblical history is assigned a ‘ministerial’ role rather than a ‘magisterial’ role in understanding the text. Our next crucial task would be to elucidate the dynamics between biblical history, the inspired text and the believing reader seeking to understand the living and active Word of God. Excerpt – The tone and nature of the inscriptions, say the study authors, combined with the remoteness of Arad and its links to the kingdom’s military administration as well as the narrowly constrained ages of the ostraca all together suggest that literacy was widespread among the Judahite army ranks, priests, and administrators as early as 600 BCE. According to the authors, this implies the existence of an educational infrastructure that may have helped to support the composition of significant literary texts in Judah before the destruction of the first Temple. “Now our job is to extrapolate from Arad to a broader area,” said Prof. Finkelstein. “Adding what we know about Arad to other forts and administrative localities across ancient Judah, we can estimate that many people could read and write during the last phase of the First Temple period. We assume that in a kingdom of some 100,000 people, at least several hundred were literate. ** This finding casts doubts on critical theories that assign much of the OT writings to the post-exilic period after the Fall of Jerusalem. Some caution should still be in place as the report just came out. We await response from the academia, but note that this study comes from experts from Tel Avi University. The Times of Israel gives one note of caution – According to Piasetzky, the existence of an educational infrastructure could have enabled the composition and compilation of biblical texts that constitute the basis of Judahite history and theology. Previous Previous post: Historical Criticism and Textual Interpretation – Part 1/3. Kairos has decided to make available online - with free access - the full text of our legal handbook, Doing the Right Thing. Our hope is that the book will help readers to gain confidence to defend their right to profess, practice and propagate their religion and to remain vigilant in defending their religious rights. Did the Medieval Church Teach that the Earth Was Flat?